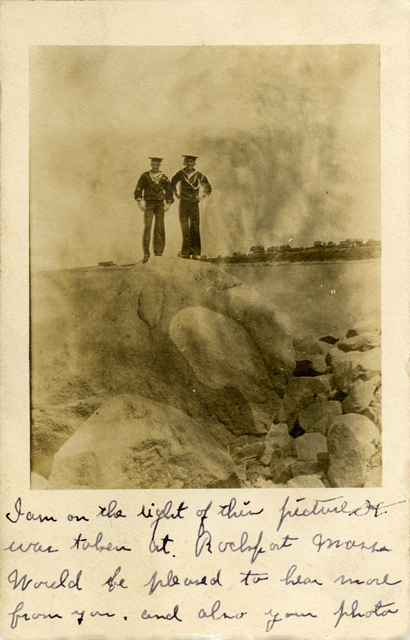 This is a real-photo postcard of two U.S. Navy sailors visiting Rockport in 1907. The card is signed by Arthur F. Duggan, who identifies himself as the sailor on the right. He indicates that he is from the battleship U.S.S. Kentucky. 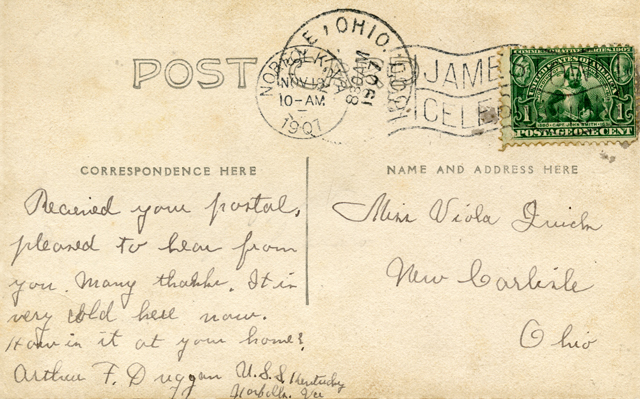 The card is postmarked from Norfolk, Va., on Nov. 19, 1907. The location appears to be somewhere near Old Garden Beach or the Headlands. The U.S.S. Kentucky was part of the North Atlantic Fleet that was formed in 1906 and that regularly visited Rockport for several years to conduct maneuvers off the coast. The Kentucky was part of the fleet’s second squadron. That squadron visited Rockport in late August and early September of 1907, just two months before this postcard was mailed. This photograph was likely taken during that visit. A month after this postcard was mailed, in December 1907, the fleet — which became known as the Great White Fleet under the command of Rear Admiral Robley D. Evans — departed from Virginia on a round-the-world cruise that lasted until 1909. The cruise was both a goodwill tour and intended as a show of the United States’ naval strength. I am on the right of this picture. It was taken at Rockport, Mass. Would be pleased to hear more from you. And also your photo. Received your postal, pleased to hear from you. Many thanks. It is very cold here now. How is it at your home? From what I can tell, Ms. Quick never married. Had she held on to this card throughout her life? We can only wonder. This entry was posted in Uncategorized and tagged Old Garden Beach, The Headlands, Warships. Bookmark the permalink.